Ralph Lauren’s signature style is... well, America. This is the man, after all, who paid $10 million towards the restoration of the original stars and stripes. Which connects to Lauren’s way of working – reworking, reinventing, indeed restoring classic American style, time and again, and preserving it for generations to come. That said, it’s a chicken-and-egg situation whether America did those styles first, or Ralph defined them for America. Which is why his work continues to fascinate. This season, Lauren went back to classic America, drawing his audience in close and tight at tables in his own café, gussied up like a 1920s soda shop straight out of The Great Gatsby. The original 1974 film of that, incidentally, Lauren costumed – and cemented a fantasy version of what American style in the 1920s looked like that has proved prevalent, not least in Lauren’s own looks. Take the home of his Madison Avenue flagship store, the Rhineland Mansion – a vast, truly Gatsby-esque French Renaissance revival townhouse, decorated inside true to its history and resembling a stately home rather than a shop. For Lauren’s Spring/Summer 2019 womenswear collection, the styles of Gatsby were subtly reflected, again and again – and although the designer didn’t cite it as a direct influence, whenever he talks about his vision, it invariably leads you back to the end of Daisy’s dock, Gatsby shimmering in the distance. What is it about The Great Gatsby that entrances us – and, apparently, Lauren? How about it encapsulating the American dream – both its pleasures and its pains – and, stylistically, a certain period of unabashed, unequalled elegance, when American ideas ruled the world for the first time? The 20s were the era of the automobile, the flapper, jazz music, the skyscraper. All, American. 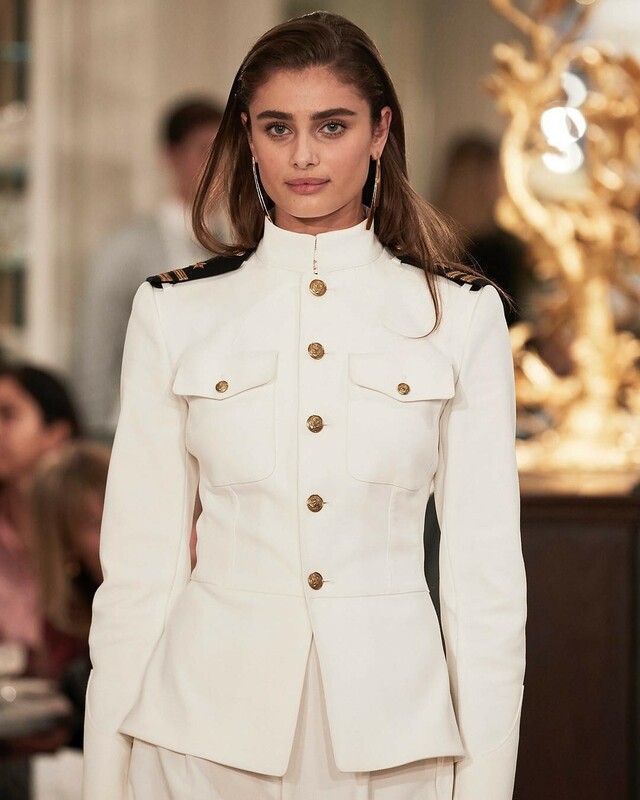 Ralph Lauren, though, isn’t borne into the past – indeed, with all the slick columns of gold, it seemed Lauren could be thinking about the very near future. Say, the 24th of this month, when the 91st Academy Awards ceremony takes place. A nominee wouldn’t look out of place wearing one of his Oscar roster of glistening golden dresses to cement her place in the history books. Or, indeed, a trouser suit – Glenn Close wore Lauren to collect her Best Actress award at the Screen Actors Guild Awards. She looked the proverbial million bucks. And rather Gatsby-esque.